Which software version and software options do I need? 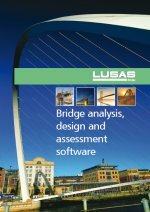 This table provides some examples of the LUSAS Bridge software product version and additional software options that are required to carry out the modelling, anslysis or design types shown. It is not a comprehensive list of the capabilities of these products. To discuss and confirm the software product and software option combination needed for your particular analysis requirements please contact your local distributor. * This is optional according to the analysis type used. * A nonlinear or a dynamic option must be used. Any modelling and analysis capabilities described on this page are dependent upon the LUSAS software product and version in use. Last modified: January 24, 2019.